This shop has been compensated by Collective Bias, Inc. and its advertiser. All opinions are mine alone. 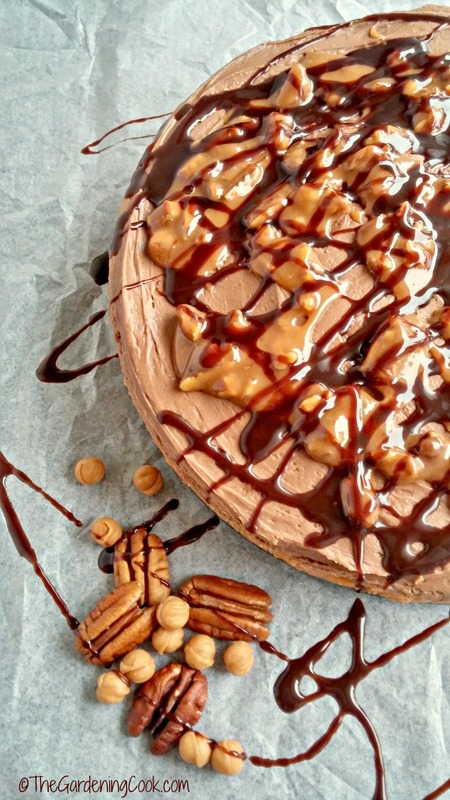 #SweetenTheSeason #CollectiveBias It’s time to make a Turtle Chocolate Pumpkin Cheesecake! The holidays are a time for me to bring out the big guns when it comes to desserts. There is nothing quite like having family or friends over for a holiday celebration and wowing them with one of your wonderful cheesecake recipes. This turtle chocolate pumpkin cheesecake will become a family favorite to be shared from season to season. This turtle chocolate pumpkin cheesecake will become a traditional holiday dessert. Be warned, though. This is not a cheesecake for one or two people. This baby is quite large, so you will need help from your guests in the eating department. But that is what holiday celebrations are made of – sharing your favorite dessert recipe for friends and family to sample. The cheesecake is a wonderful blend of layers. 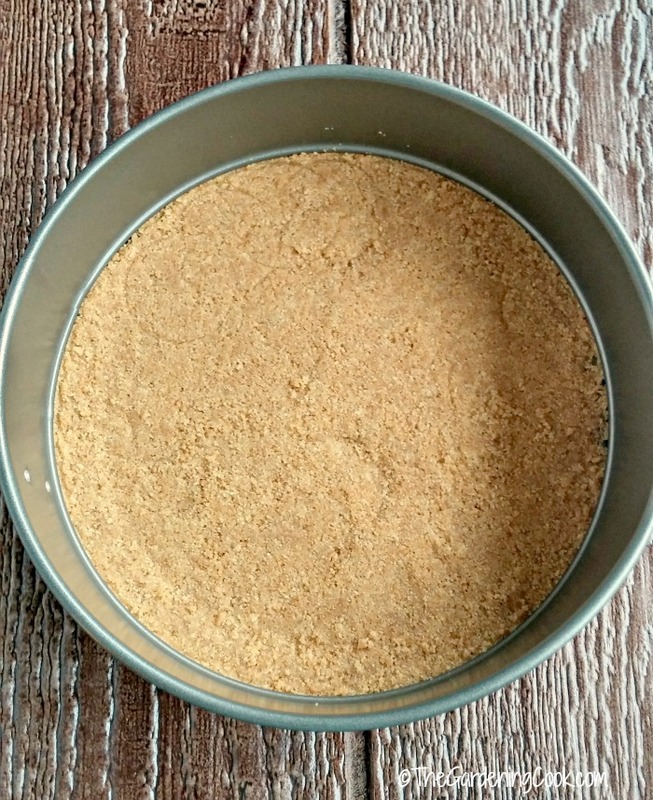 The crust is sweet and crunchy with a delicious graham cracker flavor. 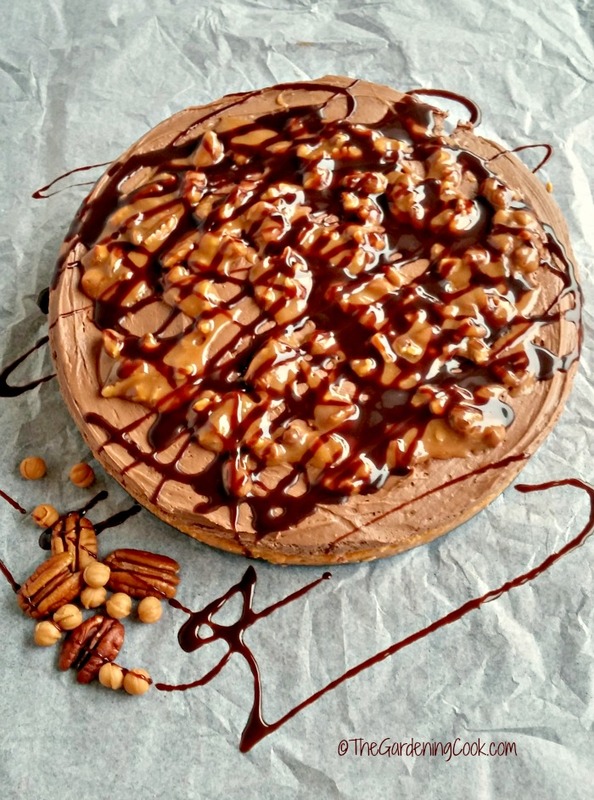 Two layers of pumpkin and chocolate cheesecake combine to delight the taste buds, and the top of the dessert is decorated with melted caramel and chopped pecans, and drizzled with more melted chocolate. It’s a dessert made in turtle chocolate heaven. This one appeals to me so much. I lost both of my parents in less than two years. Mum’s favorite pie was pumpkin, and dad’s favorite candy was Turtles. When I make this dessert, I get to enjoy both of their favorites and it warms me to the core. Since the holidays are such a busy time, I am always looking for ways to take short cuts. For this dessert, my helper comes in the form of a Jello no bake pumpkin style pie mix. All I need to do to make the bottom layer is to combine cream cheese with the pumpkin pie pix. Baker’s semi sweet chocolate and cream cheese combine for my second layer and Kraft caramel bits and extra chocolate add the topping of all toppings. With these scrumptious ingredients going into the cheesecake, how can it fail? I love how easy this pie is to put together. I used a spring form pan which has fairly tall sides to help hold the layers of this wonderful dessert. If you have not used a spring pan in the past, but sure and try one for this dessert. 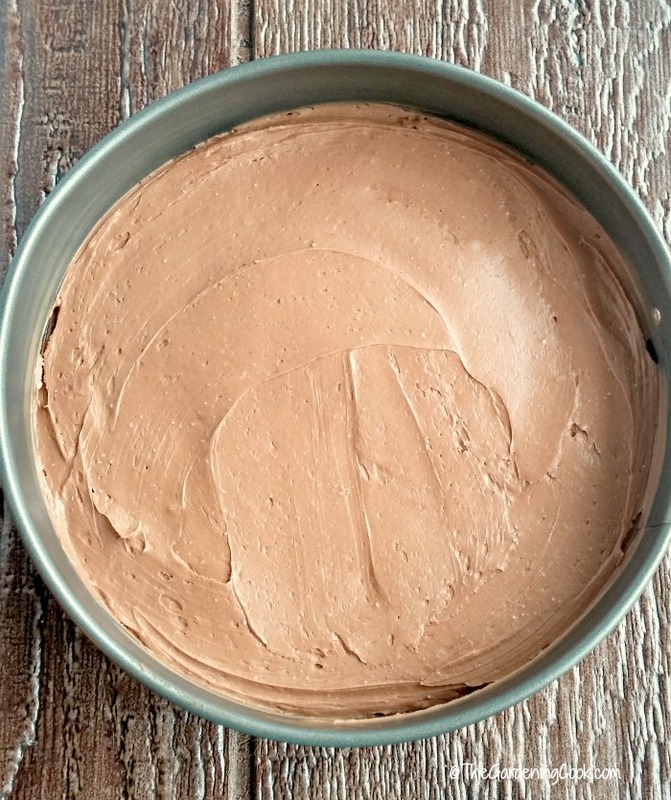 When the cheesecake is finished and set, the top part of the pan has a hinge that just unfastens, and the cake is easily removed. This makes is simple to cut and serve. Using a packaged Jello mix saves me so much time since the flavor is already in the pumpkin mix. Each section of the cheesecake is made separately and then layered over the crust mix in the spring form pan. I used 1/2 package of cream cheese to make the pumpkin layer more creamy and not quite so “pumpkiny” since I wanted the two flavors to combine well. It has just a hint of pumpkin and goes very well with the chocolate layer. Smooth out the top layer and place it in the fridge to set for at least 2 hours. You can prepare the turtle topping while it starts to set to save total time. And now comes the fun part – finishing off this delicious cheesecake with the caramel pecan topping. It will make you think you have one big ole Turtle in your fridge just beckoning you for a taste. But DON’T YOU DARE! This scrumptious dessert deserves a prime spot on your holiday table and displaying it with a bite or two out of it is just not allowed! The turtle chocolate pumpkin cheesecake is so festive looking. Those sweet caramel bits combined with chopped pecans and then drizzled with some melted chocolate are the perfect way to finish up this tasty holiday sweet treat. The flavor is rich and decadent, so all that you will need is a small piece to be perfectly satisfied. 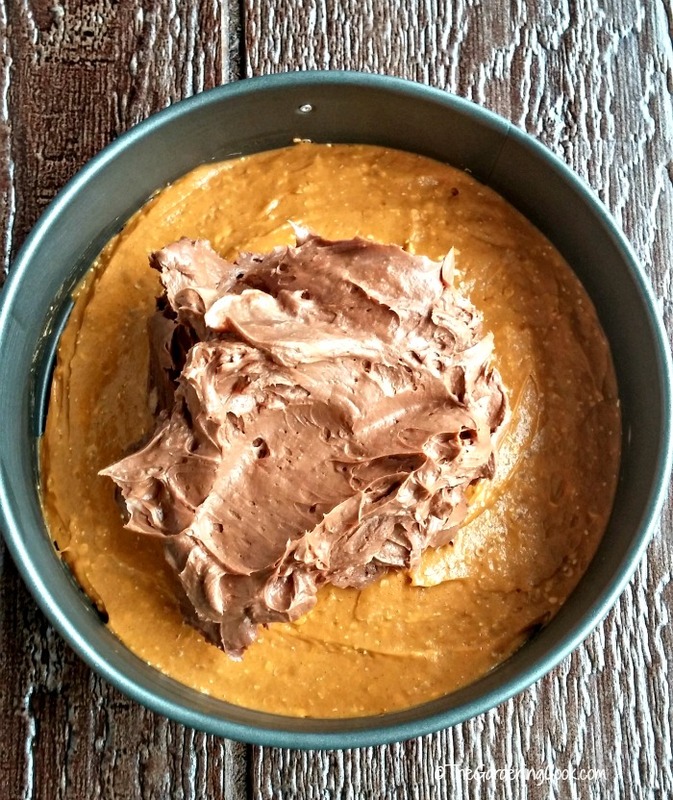 Mmmm,…mmmm… rich, creamy layers of pumpkin and chocolate and that topping! It will be the hit of your Thanksgiving dessert table, and every one will be asking for the recipe so that they can make it next year. They will be amazed when they find out how easy such a fancy dessert is to make! All those layers! The bottom part tastes like a pumpkin pie that crossed paths with a cheesecake. This makes it the best of both worlds. Rich semi sweet chocolate adds the decadent touch that is needed and that topping! WHOA…that topping is something else!! 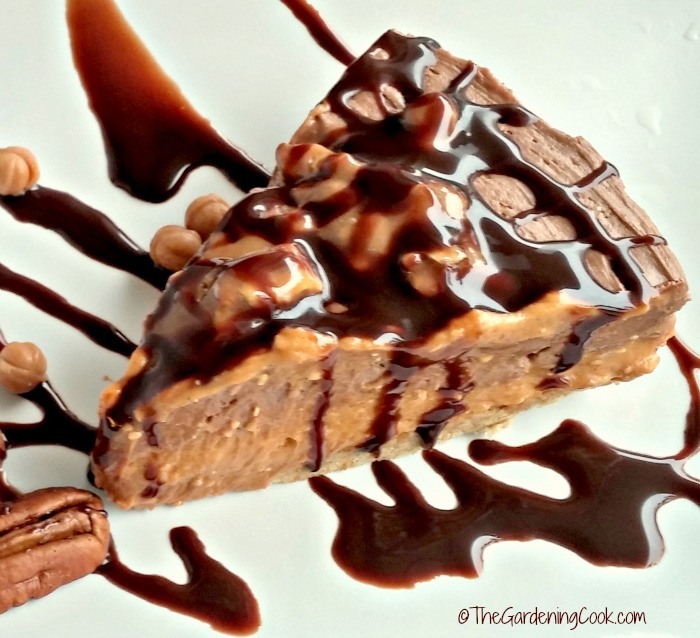 This turtle chocolate pumpkin cheesecake will be one that will be talked about long after the dessert is finished. 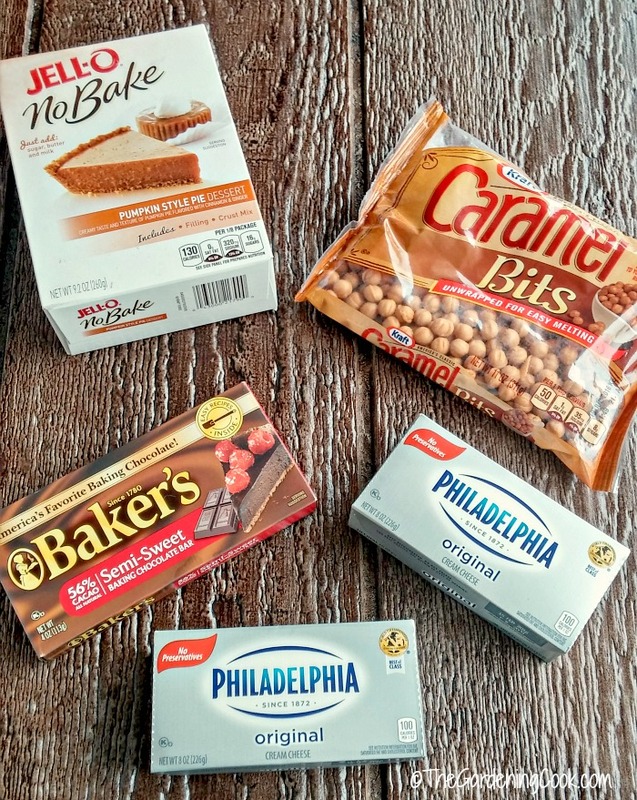 Kraft makes things so easy on the shopping trip too, since the goodies for holiday baking needs are all found in one convenient place in the store. 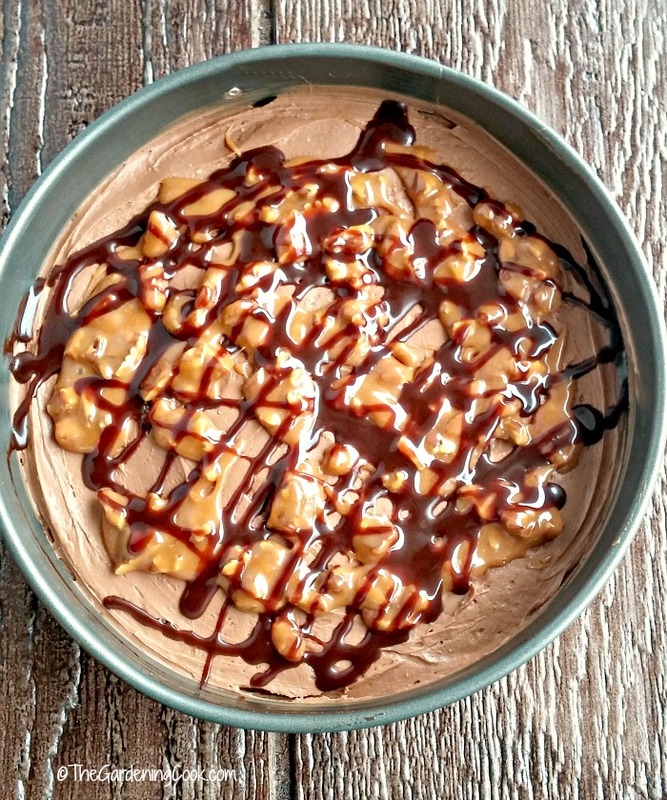 If you would like to recreate this delicious turtle caramel pumpkin cheesecake, just visit your local Walmart and head for their fully stocked Baking Center. 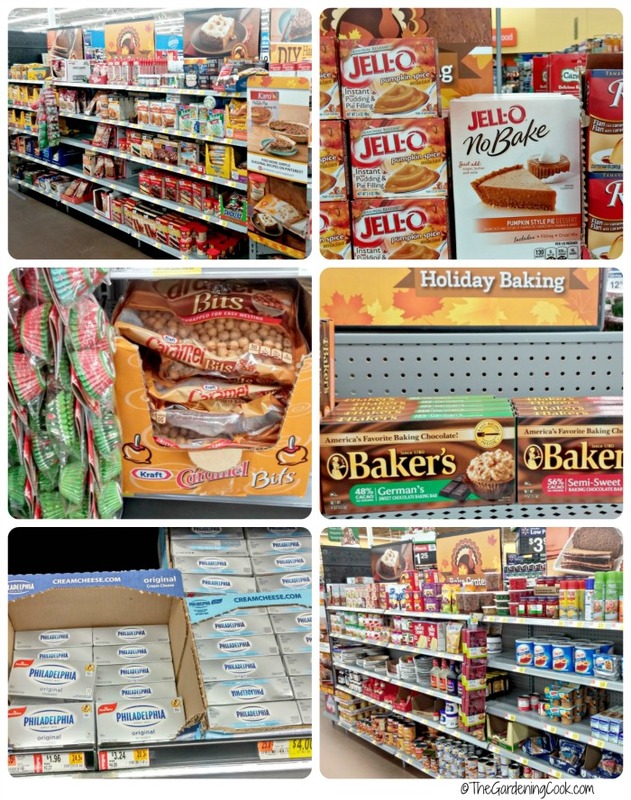 This special display contains everything you need to make your holiday baking easy and budget friendly. I’d love to hear about your holiday dessert recipe! Please share your ideas in the comment section below. Place 5 tbsp of butter in a microwave safe bowl and heat until melted. Combine the crust mix from the pumpkin pie with 2 tbsp sugar and stir in the melted butter. Place in the bottom of a spring form pan and set aside. Combine ½ pkg cream cheese and 2¼ cup of cold milk in the bowl of a stand mixer. Beat until smooth. Beat in the pumpkin style pie mix until everything is well combined and the filling is smooth. Spoon it into the spring form pan on the crust and smooth it out. Place in the fridge while you make the chocolate later. Beat together 1½ pkgs of cream cheese, ¾ of granulated sugar, the heavy whipping cream and 1¾ tbsp cold milk. Continue mixing until the filling is smooth. Place the Baker's semi sweet chocolate into a microwave safe bowl and cook it in 20-30 second increments, stirring between each until the chocolate is melted and smooth. Stir it into the cream cheese mixture and beat until smooth and creamy. Spoon it over the pumpkin layer and smooth it out. Place in the fridge while you make the turtle layer. Combine ⅔ cup of caramel bits, and 1 tbsp of water in the microwave. Heat in 20 second increments until melted. 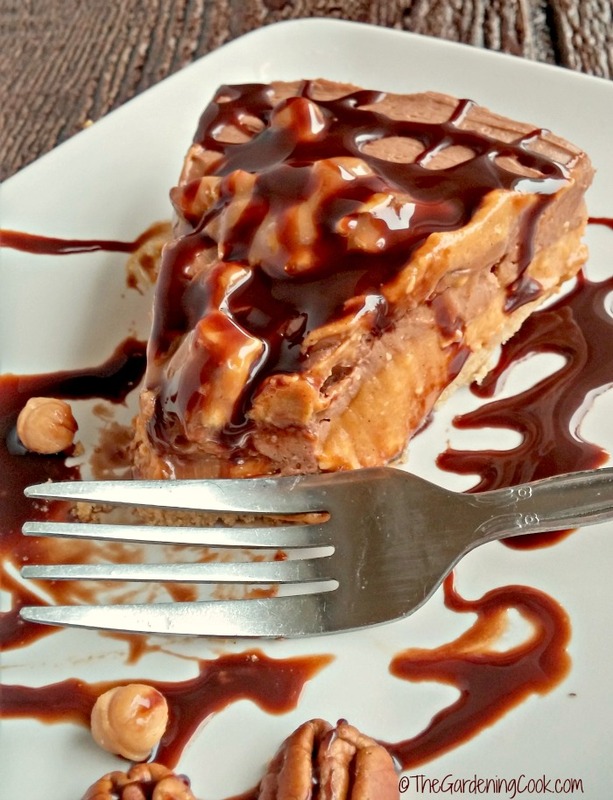 Stir in ¼ cup of chopped pecans and spoon the turtle topping over the chocolate layer. I just did it in clumps, and did not bother to smooth it out..
Drizzle some melted chocolate over the top. Place it back in the fridge to set completely for at least 2 hours. Hi Melanie. It gave a nice crunch to the texture of the cheesecake. It’s really tasty. We sampled it this week! Thanks Heather. I have to admit, it was pretty tasty! No. Way. ha ha. This sounds amazing!